Lucene (and thus Elasticsearch) uses the Boolean model to find matching documents, and a formula called the practical scoring function to calculate relevance. This formula borrows concepts from term frequency/inverse document frequency and the vector space model but adds more-modern features like a coordination factor, field length normalization, and term or query clause boosting. Don’t be alarmed! These concepts are not as complicated as the names make them appear. While this section mentions algorithms, formulae, and mathematical models, it is intended for consumption by mere humans. Understanding the algorithms themselves is not as important as understanding the factors that influence the outcome. will include only documents that contain all of the terms full, text, and search, and either elasticsearch or lucene. This process is simple and fast. It is used to exclude any documents that cannot possibly match the query. Once we have a list of matching documents, they need to be ranked by relevance. Not all documents will contain all the terms, and some terms are more important than others. The relevance score of the whole document depends (in part) on the weight of each query term that appears in that document. The weight of a term is determined by three factors, which we already introduced in What Is Relevance?. The formulae are included for interest’s sake, but you are not required to remember them. The term frequency (tf) for term t in document d is the square root of the number of times the term appears in the document. Setting index_options to docs will disable term frequencies and term positions. A field with this mapping will not count how many times a term appears, and will not be usable for phrase or proximity queries. Exact-value not_analyzed string fields use this setting by default. The inverse document frequency (idf) of term t is the logarithm of the number of documents in the index, divided by the number of documents that contain the term. This field will not take the field-length norm into account. A long field and a short field will be scored as if they were the same length. For use cases such as logging, norms are not useful. All you care about is whether a field contains a particular error code or a particular browser identifier. The length of the field does not affect the outcome. Disabling norms can save a significant amount of memory. These three factors—term frequency, inverse document frequency, and field-length norm—are calculated and stored at index time. Together, they are used to calculate the weight of a single term in a particular document. When we refer to documents in the preceding formulae, we are actually talking about a field within a document. Each field has its own inverted index and thus, for TF/IDF purposes, the value of the field is the value of the document. Of course, queries usually consist of more than one term, so we need a way of combining the weights of multiple terms. For this, we turn to the vector space model. The vector space model provides a way of comparing a multiterm query against a document. The output is a single score that represents how well the document matches the query. In order to do this, the model represents both the document and the query as vectors. In the vector space model, each number in the vector is the weight of a term, as calculated with term frequency/inverse document frequency. While TF/IDF is the default way of calculating term weights for the vector space model, it is not the only way. Other models like Okapi-BM25 exist and are available in Elasticsearch. TF/IDF is the default because it is a simple, efficient algorithm that produces high-quality search results and has stood the test of time. 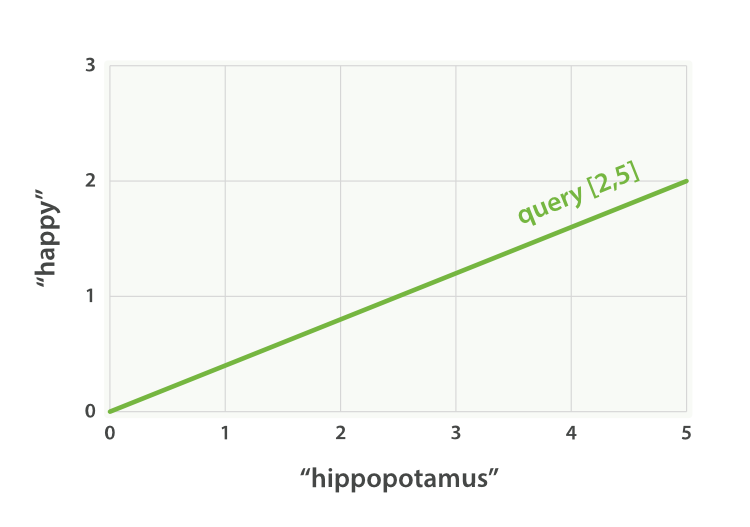 Imagine that we have a query for “happy hippopotamus.” A common word like happy will have a low weight, while an uncommon term like hippopotamus will have a high weight. Let’s assume that happy has a weight of 2 and hippopotamus has a weight of 5. 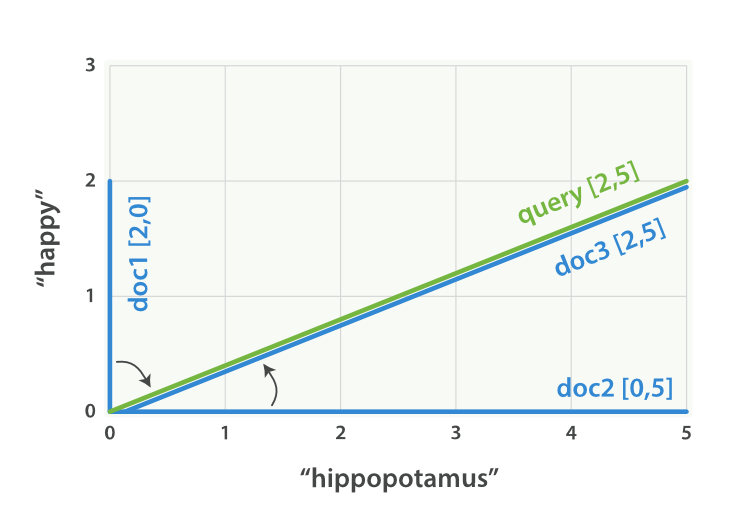 We can plot this simple two-dimensional vector—[2,5]—as a line on a graph starting at point (0,0) and ending at point (2,5), as shown in Figure 27, “A two-dimensional query vector for “happy hippopotamus” represented”. The nice thing about vectors is that they can be compared. By measuring the angle between the query vector and the document vector, it is possible to assign a relevance score to each document. The angle between document 1 and the query is large, so it is of low relevance. Document 2 is closer to the query, meaning that it is reasonably relevant, and document 3 is a perfect match. In practice, only two-dimensional vectors (queries with two terms) can be plotted easily on a graph. Fortunately, linear algebra—the branch of mathematics that deals with vectors—provides tools to compare the angle between multidimensional vectors, which means that we can apply the same principles explained above to queries that consist of many terms. You can read more about how to compare two vectors by using cosine similarity. Now that we have talked about the theoretical basis of scoring, we can move on to see how scoring is implemented in Lucene.